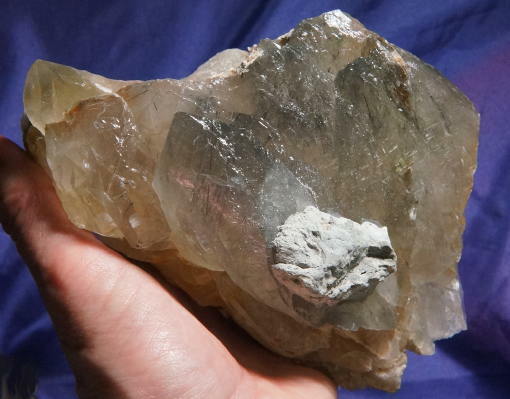 This is a sweet, 2 lb 5.7 oz cathedraled DT quartz from Genipago, Brazil, 5.9" by 3.8" by 2.9". She has a nice smoky-citrine color although the fine needles of blue tourmaline (indicolite) that are thick in some areas belie the color and give her a wondrous blue cast and they are a delight to explore with your loupe. And with that loupe, you'l see that there are quite a few colorless (aka "olenite") tourmalines included as well. She has nice Lemurian lines and is in fact, a cathedral lightbrary shard. A shard is a crystal who was badly damaged within the Earth and has healed through the eons into wondrous expression that is different from the original crystal, but often far more beautiful. There is a bit of mica as well as areas that are clusters of tiny, glittering tourmaline crystals blended with what looks like sand (likely minute quartz crystals). She is beyond stunning when you open up to her energies and give her a chance to express her wondrous being! There are some very tiny dings, but otherwise she is simply glorious! I was so blown away by this Spirit ... between the warmth and comfort of her delicate citrine and the electric energy from the tourmaline, she is a very, very unusual crystal offering a variety of energies for her Keeper. The citrine and tourmaline combine to make her a potent Third Eye stimulator ... now citrine is generally more for the Solar Plexus, but I find this Spirit working in a different manner. We perceive things on many levels including the occult. These messages are often cloaked in mystery and difficult to decode, thus they are also often ignored. Working with this Spirit can assist with the decoding and putting into physical expression so that you can communicate both to your Self and others exactly what you "see". She is a Spirit for a Light Worker coming into their strength and "power", discovering all that is open to them now. In addition, shards are the ultimate healers! This Spirit can be a critical part of a crystal healing or Reiki practice where she can assist both the patient and the practitioner in addressing the true nature of the illness. She helps to strip away the underlying causes, leaving the patient open to the repair to follow. In this manner, she stimulates a real healing, not just a fixing of the symptoms. She allows the patient to transmute the negative energies caused by illness into positive ones for growth and healing. She will bring a whole new meaning to your experiences and progress ... healing on every level!